Police investigating an assault in Worthing on a man leaving a pub yesterday are appealing for anyone with CCTV to get in touch. A 25-year-old local man was taken to Worthing Hospital with a serious head injury following the attack in Warwick Street at about 2am on Saturday. He had earlier been drinking at The Warwick pub, and upon leaving the premises, he was punched to the back of the head from behind, causing him to fall to the ground. The suspect is described as a white man, about 5ft 11ins, of medium build, and with hair styled with a quiff. He was wearing a black hoody with the hood up, dark trousers and black footwear. Following the assault, the offender was seen to run south down an alley towards Bedford Row. Detective Sergeant Simon Dunn said: “There was also an altercation inside The Warwick pub shortly before the attack, which we believe may be linked. “We are reviewing CCTV from the pub and the surrounding area, and we want to hear from local residents who have CCTV in the vicinity of Bedford Row which could assist in our investigation. 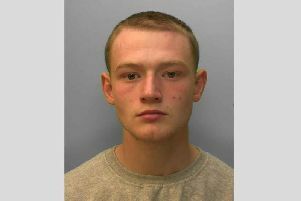 The victim has since been transferred to Royal Sussex County Hospital in Brighton, where he remains in a serious but stable condition. Anyone with any information is asked to contact 101@sussex.pnn.police.uk or call 101, quoting Operation Aspro. Alternatively, members of the public can call independent charity Crimestoppers anonymously on 0800 555 111.